It's that time of year, webarinos! Year-end stat time. The most searched this, the most popular that, the celebrity whose naughty bits were most often looked for online, etc. 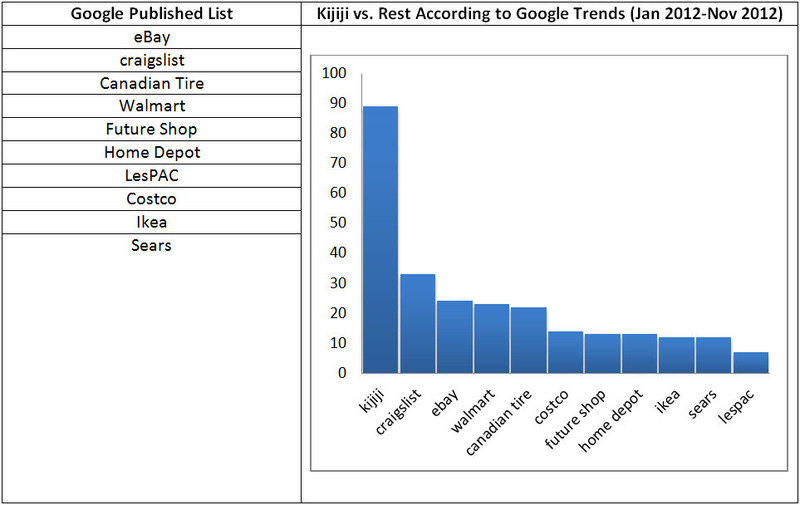 And in Google's Zeitgeist List of Most Searched in Retail 2012, you won't find one name with which readers here are intimately familiar -- Kijiji. Now, personally, as much as I love Kijiji, "retail" is not what springs to mind. In fact, I've always considered Kijiji an anti-retail site or retail alternative. When retail retailers retail their retail goods on Kijiji, I get turned off. Kijiji, to me, has been person-to-person local buy and sell classifies. Not retail. Besides, you can't buy things ON Kijiji. It's not an online retail site. But let's suspend disbelief, because this story is really about eBay Classifieds (Kijiji's daddy) and their PR reaction. I think they've made a clever move in raising righteous indignation over being left out of the list. See that enormous phallic blue bar on the far left of the graph? That's searches for Kijiji, according to Kijiji. 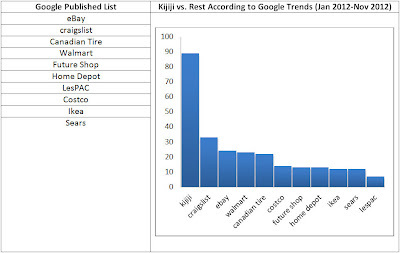 Kijiji's in-house number-crunchers say they used Google's own Trends analytics tools, to clearly track their position as the most-searched retail site in Canada. "Mistakes happen to everyone!" said Kijiji marketing honcho and all-around kickass guy Bart Molenda. "But the numbers don't lie: Kijiji is the clear leader amongst competitors in searches for online retail brands in Canada. We're not calling for a recount, but we do hope that next time we get invited to the Zeitgeist." Them's fightin' words. You're better at Google analytics than Google Analytics? You're telling me I can't satisfy my wife? You wanna go? I'll go ya! Listen -- if Google has a reason why it didn't include Kijiji in its roundup, it should fess up now. Even if the reason is this: Kijiji is not a retail site. If Google wants to assert that Kijiji is Canada's number-one free online classifieds site, enabling the best transactions from coast to coast to coast, and *NOT* a retail site, that's cool with me. I want the two sides to kiss and make up. And stroke each other's hair a little. Yeah, now move your hands a little lower. If Kijiji isn't a retail site then do you think Craig's List is? Because they made the list for some reason.